On Tuesday, September 8, the feast of Our Lady’s Nativity, Raymond Cardinal Burke will celebrate a Pontifical High Mass at St. Peter’s Catholic Church, located at 425 N 4th St., in Steubenville, Ohio. The Mass will begin at 10:30 a.m., sung by the University’s Schola Cantorum Franciscana, directed by Nicholas Will, professor of Sacred Music, and accompanied on the organ by Andrew Barnick. That evening, His Eminence will give a keynote address on the upcoming Synod on the Family and the instrumentum laboris, followed by a panel discussion of expert theologians and philosophers, including himself and NLM’s own Dr. Peter Kwasniewski. This will take place at Franciscan University of Steubenville, complete information about the program of events is available at this link. Corrigendum: Please note that Card. Burke’s keynote address, and the panel discussion which follows, have been moved from the originally proposed venue to the Finnegan Fieldhouse, as noted at the given link above. On the evening before, Monday, September 7th, Dr Kwasniewski will deliver a lecture entitled “The Old Mass and the New Evangelization: Beyond the Long Winter of Rationalism,” at 8 p.m. in the Gentile Gallery of the J.C. Williams Center at FUS. Card. 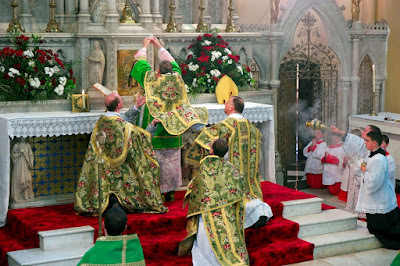 Burke celebrating Mass at the Fota conference this July.